Here’s a look at what happened during Week 1 of the high school football season. 1. We already knew it, but Pahranagat Valley proved once and for all that it is the nation’s top eight-man football program. The Panthers dominated Wells 54-8 to run their winning streak to 94 games, setting a national eight-man record. Shattuck (Oklahoma) won 93 consecutive games from 2003 to 2009. 2. Bishop Gorman may get the national hype, but there are some other programs worth watching. 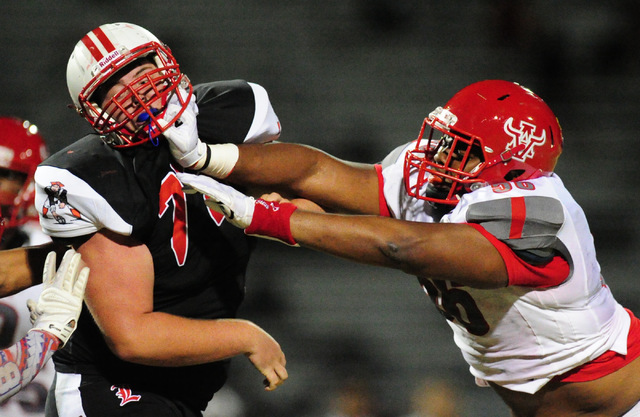 Just look at the opening-week battles between some of the area’s other top teams. Liberty’s Ethan Dedeaux had just two catches, but both went for touchdowns in a 27-23 win over Arbor View. Desert Pines got a surprising boost from a kicker, as Turner Klingenmeier’s 25-yard field goal gave the Jaguars a 44-41 win over Centennial. Centennial’s Jamaal Evans accounted for 405 total yards and five touchdowns through the air and on the ground. 3. Sunrise Mountain has a dangerous offense and could be poised for a breakout season in Class 3A. The Miners, who went 6-4 last season and made their first postseason appearance, racked up 598 yards of offense in a 39-6 win over Boulder City. Stephen Wright aired it out, completing 20 of 25 passes for 454 yards and four TDs. Five receivers had at least 50 yards, and two topped 120. Sierra Vista 21, Moapa Valley 12 — Moapa Valley has played in the state title game in nine of the past 10 seasons, so the Pirates are automatically thought of as a contender when the season starts. But three turnovers doomed Moapa Valley on Friday night. Sierra Vista, in its first season back at the Class 4A level, was just 3-7 last season in Division I-A (now Class 3A). But the Mountain Lions turned all three turnovers into scores to down Moapa Valley. The Pirates had won the previous three meetings. — Liberty coach Rich Muraco after the Patriots topped Arbor View, 27-23. — Las Vegas coach James Thurman after a 35-minute weather delay helped the Wildcats steal the momentum in a 28-7 road win over Palo Verde. — Durango coach Matt Gerber after his team beat Valley 40-0 Thursday to snap a 16-game losing streak. — Green Valley sophomore quarterback Kalyja Waianae, who threw two TD passes and ran for a score to lead the Gators to a 21-8 win over Desert Oasis in his first varsity start. For complete coverage of all of the games from Week 1, visit nevadapreps.com.